Agronomic panel survey was conducted in Bako Tibe district to assess current farmers maize agronomic practices and associated actual maize grain yields. The survey was conducted using 100 households. Most of the maize farms (90%) were characterized as having strongly to strongly acidic soils, low to medium SOC, medium to high TN, very low to low av.P, high to very high exch. K, low to medium exch.Ca, and medium to high exch. Mg, high av. Zn and Fe and very high Mn contents. Most farmers (94%) grow improved maize varieties and 80% of them grew a pioneering hybrid Limu and Bako hybrids BH540 and BH543. Most farmers (97%) apply different inorganic fertilizers and of them >70% of them applied NPS+Urea or NPS alone. Farmers rarely retain crop residue. Most farmers (81%) maintain lower plant density at harvest than the recommended density and the density declined from vegetative to harvesting stage. About 99% of the farmers grow sole maize, 57% rotate maize with other. Percent weed cover of the farms were 25% on average but reached as high as 80%. About 87.5%, 86%, 75% of farmers harvested grain yield that was higher than the national, regional and zonal average, respectively. Since most maize farms (90%) were very strongly to strongly acidic, there is a need to apply lime to improve maize productivity and nutrient use efficiency in the area. The poor weed and crop residue management, sole cropping of maize and lower plant densities practiced by farmers were among the gaps observed that potentially reduce maize productivity in the study area unless the extension sector intervenes. However, the current trend improved maize varieties and inorganic fertilizers use is promising and needs to be encouraged for intensification of maize production in the study area. 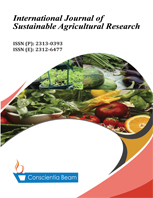 This paper serves as the most recent study on maize agronomy in Ethiopia in giving sight to the nutrient status of soils of the best maize growing district in the region. It also gives an insight into what the maize agronomic practices (cropping system, crop residue management fertilizer, and improved maize variety use) look like in the distinct.